Tiril Hasselknippe’s brew of blissful neo-materialism and banal video game aesthetics is just the right amount of a good thing, i.e. too much. Tiril Hasselknippe, Forest of my Eye, 2019. Photo: Vegard Kleven. 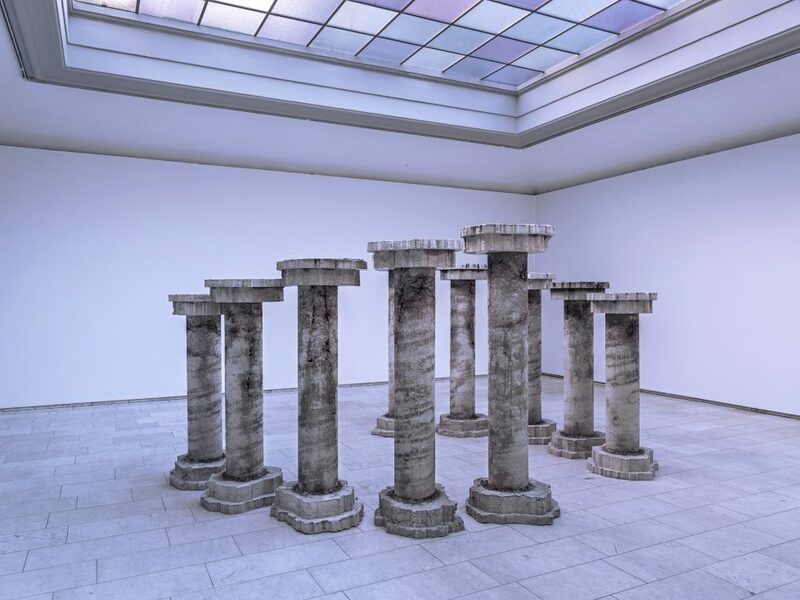 In the skylight-topped hall at Kunstnerforbundet, ten distressed concrete columns topped by vessels resembling bird baths stand in the middle of the floor. Tiril Hasselknippe’s (b. 1984) objects look like they have weathered centuries. Forest of my Eye continues the blend of quasi-archaeological tactility and ad hoc functionality that has been a hallmark of the artist’s work since she graduated from the Malmö Art Academy in 2013. For her 2016 solo show FIN at Tranen in Copenhagen, Hasselknippe affixed to the venue’s distinctive balcony a number of vivid green, vaguely box-shaped polyester structures like architectural outgrowths. 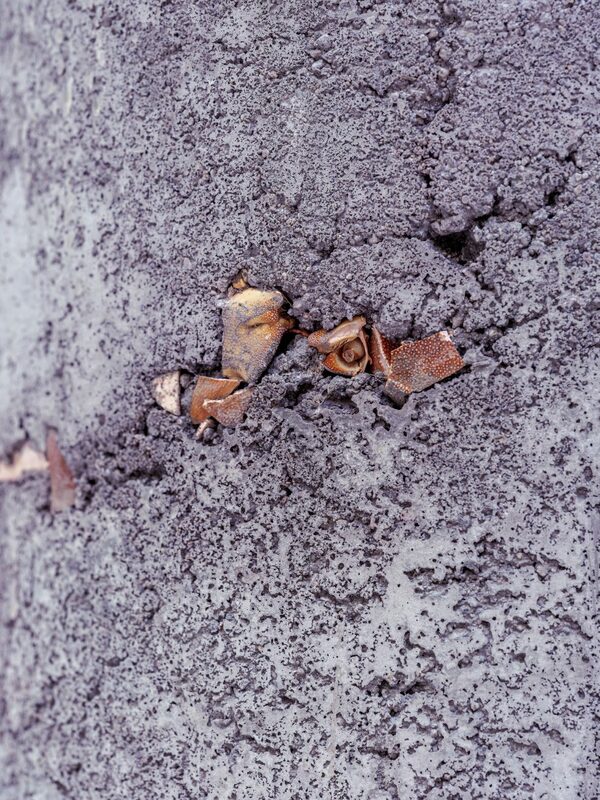 Her website is an endless scroll of brute forms in concrete, metal, wood, and plastic that look as if they have been torn from larger constructions. Suspended from ceilings, propped against walls, or lying on the floor, these fragments bristle with unformed possibility. Hasselknippe’s objects are frequently containers of some kind. The vessels placed on top of the pillars at Kunstnerforbundet contain materials that are used to make water filters: pebbles, gravel, sand, and coal. Each of the ingredients appears in two vessels; in addition to these, we find two vessels containing only water. Varying in height, the columns are arranged one after the other in two ascending, curved rows that combine to describe a circle. To see what the containers on the tallest pillars hold, a person of average height, like me, needs to make an awkward little jump. Coloured light filters cover selected panes in the skylight, drawing attention upwards. A speaker placed under a half-open window emits a sound described in the worklist as an “auditory conversation” between Hasselknippe and Pearla Pigao, an Oslo-based artist. The audio was created using a waterphone, an instrument containing water that produces a shaky, atonal sound typical of classic horror movies. With my head tilted back, gazing up at the coloured windowpanes in the ceiling, swathed in this ominous, atmospheric vibration, I sense that I am supposed to see myself standing inside a flooded temple or church space; to top it off, there are even remnants of crushed crab shells embedded in the columns. It is a little like being in a virtual reality game, where I am on a mission to retrieve the pieces of the water filter and assemble them into a functioning device in order to get to the next level. The illusory quality of Hasselknippe’s installation is strangely distancing. Its divine symmetry combined with the coloured glass and the sound effects hint at an immersion that never comes to pass. I’m nudged towards, but never over, the threshold to an active rather than contemplative mode. This ambiguity is an asset, however. Hasselknippe’s eerie soundtrack impedes the aestheticization otherwise invited by her intimately material post-minimalist formula. One might say that she profanes the object, returning it from sanctity to utility. The dramatic supplements in Forest of my Eye stress Hasselknippe’s desires for release and activation.